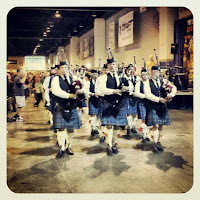 Last year, I had no idea what the Great American Beer Festival was all about. Reading people's tweets and Untappd check-ins, I figured out it was a pretty epic beer event. 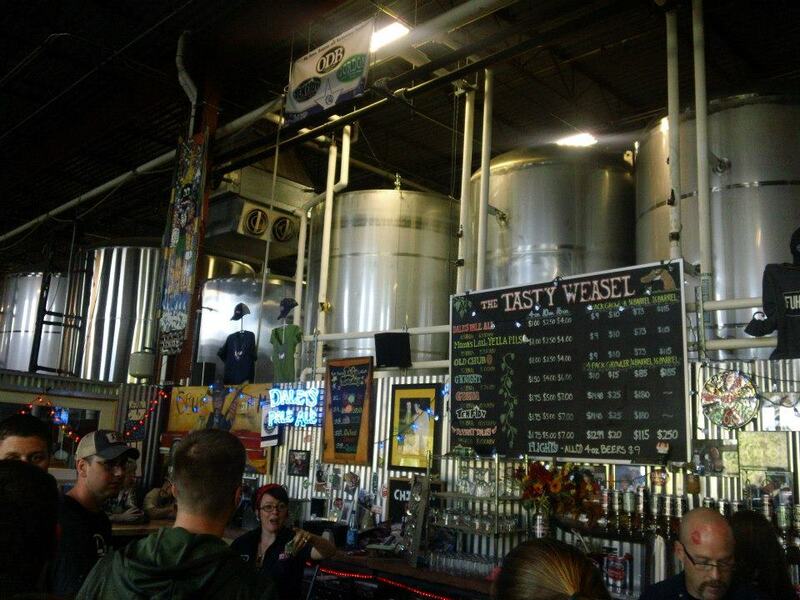 Breweries I had never heard of along with beers that sounded foreign. I decided that 2012 would be my year to attend the festival. Travelling from Orange County, CA to Denver, CO is a pretty short flight. Arriving at the airport, I was extremely excited to hope on the plane, but the airline had different ideas. Our flight was delayed by an hour, which at first made me sad. Thankfully, the Jack Daniels and Coca Cola I consumed aboard the flight made the delay slip into my memory. The first highlight of my trip to GABF was not being charged for my mixed drink. I was pretty excited and smiled and thanked the flight attendant as we deplaned our aircraft. Arriving in Denver, it hit me, we were here! The land of craft beer! But first, we had to take a shuttle to our rental car facility. I had reserved a compact car and of course, at the rental agency the employee tried to up-sell me. Would I like to drive a BMW for only $65 extra per day? Would I like to upgrade to a full size car for $30 extra per day? I politely declined all of the employees offers. When she finally checked to see which car I would be driving, she told me they were sold out of the compact cars. At first I thought, great, now I will HAVE to drive a BMW! To my surprise, I was told I would be able to drive an SUV for the compact car price. Second upgrade of my trip! After our short drive to our hotel, which was located ten miles or so from the Convention Center, we were told that the room we had requested was no longer available. I started to laugh as the front desk clerk told me they were going to upgrade us to a two room suite. At this point, I was really starting to love Denver and I hadn't even been to GABF yet! The next morning, we joined the owners of Bootlegger's Brewery, where my boyfriend works, and some of the other employees for a journey to some of the local breweries. 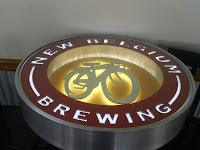 Our first stop was New Belgium Brewing. We were greeted by an amazing selection of food and beer to sample as we waited for our tour to begin. The beginning of the tour started with a visit to a shiny curved slide, how many work places have a slide besides fast food restaurants? 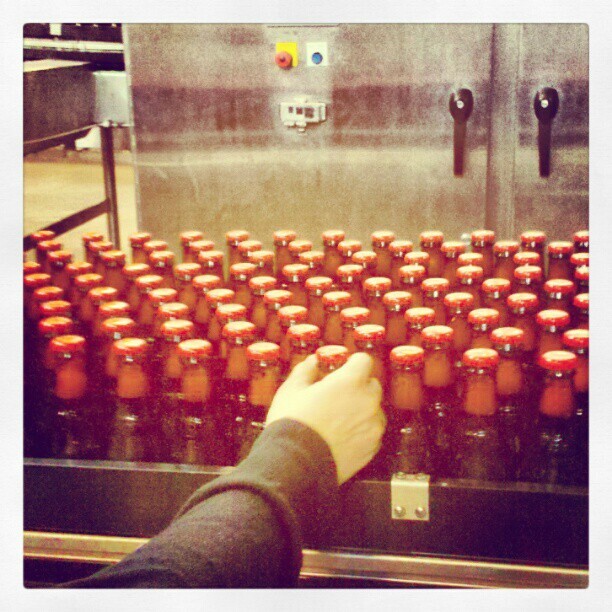 We continued with viewing the various production areas of the brewery. Along our tour, we had a stop at a small tasting area where we were able to re-fill our glasses. Grabbing a bottle of fresh Fat Tire! My favorite part of the tour was visiting the bottling and packaging area. 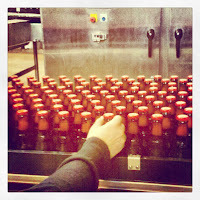 This is where we were each allowed to take a bottle of freshly bottled Fat Tire off of the line. I felt like I was in the opening credits of Laverne & Shirley! 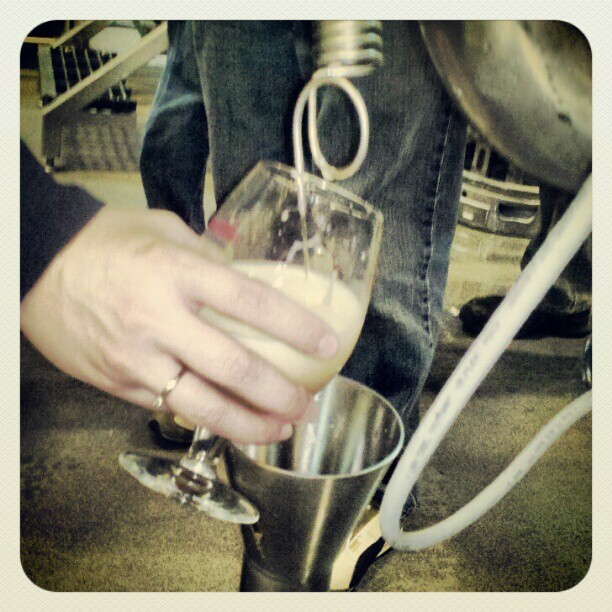 We were also allowed to taste fresh Fat Tire directly from the fermenter. Fresh Fat Tire from the fermenter. Our tour guide was very patient as we snapped photos and took our time trying to take in all of the sights. I loved seeing all of the bicycles along our tour. 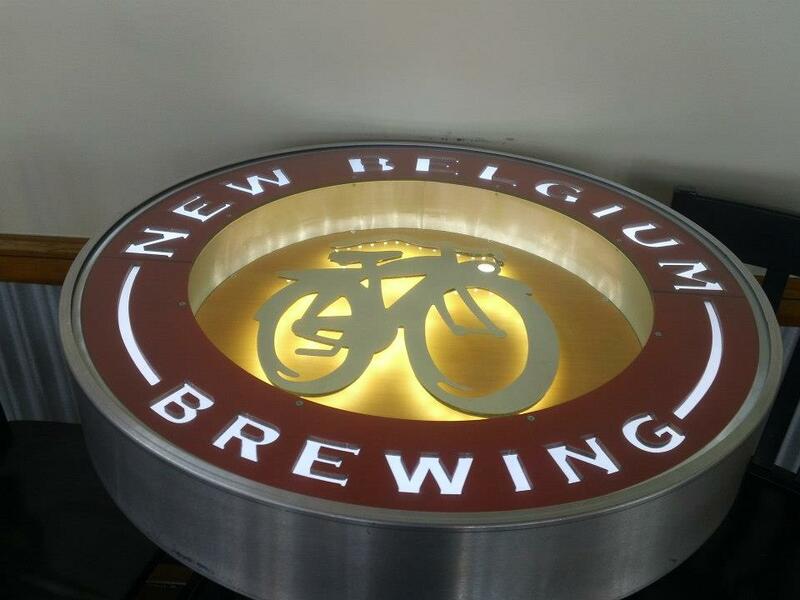 After working at New Belgium for a year, every employee is given a bicycle. What a cool idea! The sheer magnitude of the bottling and packaging facility was a bit overwhelming. Robotic arms were moving cases of beer with ease while we just watched in awe as they were completing their tasks. After our tour concluded, I was able to purchase some of my favorite beer, Super IPA. We were then on our way to our next destination, O'Dell Brewing just a few minutes down the road. O'Dell Brewing is not as large as New Belgium but is still an impressive facility. While we did not go on a tour, we did spend a good amount of time sampling beers in the lovely tasting room. Instead of getting a tasting flight, I opted for a full pint of beer. Our next stop was Oskar Blues' tasting room. I really liked the ambience of Oskar Blues which had live music as well as a no frills environment. Just like at O'Dells, instead of a flight of beer, I opted for a pint of beer. We were pleasantly surprised to find different years of Ten Fidy available and tried the 2009 version. It did not disappoint! Upon finishing up at Oskar Blues Brewery, we headed back into downtown Denver. 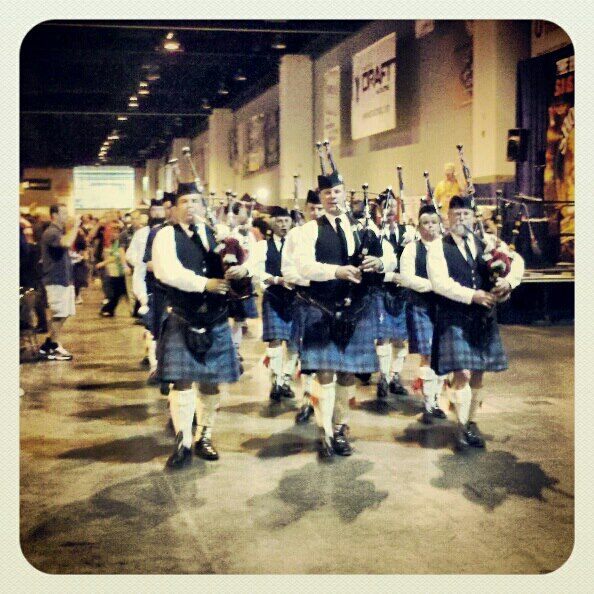 This is when I had my first opportunity to visit GABF. I wasn't quite sure what to expect when I entered the massive convention center. My first thought after receiving my tasting glass and entering the doors of the convention center was simply, "wow!" I've been to numerous beer events, but nothing comes close to the number of brewery booths that are set up at GABF. I was a bit worried that I might get lost and never find my way out until I quickly realized that the layout was organized according to region. I was happy to see that there were not any huge lines at any of the booths, as I've seen at other events for popular beers. Since I'd had such a long day, I didn't end up staying only a few hours during my first session of GABF. I decided that going to bed early would be better so I could enjoy my second session at GABF more fully. 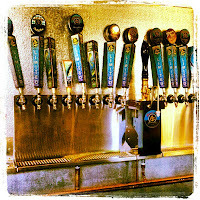 On Saturday, July 7th, 2012 Beachwood BBQ & Brewing turned one year old! A first birthday is always cause for a celebration. 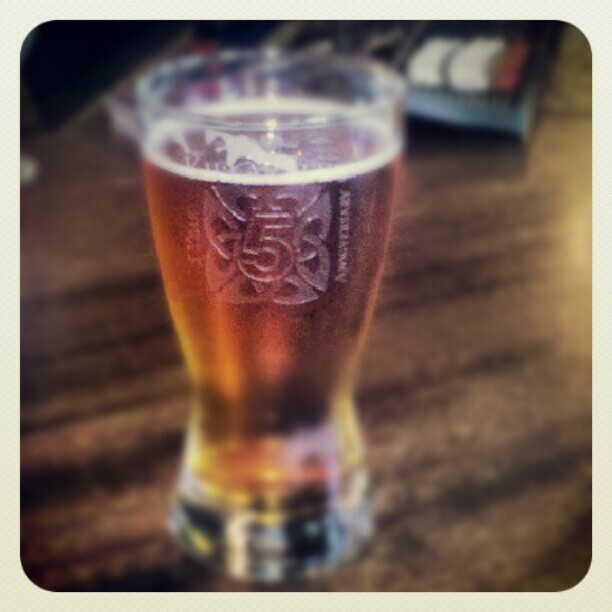 When amazing beer, food, friends, and live music are involved it makes any celebration that much more enjoyable! For their anniversary, Beachwood BBQ & Brewing not only had some great beers on tap, but they also had specialty food items on the menu. I tried the Apple White Cheddar Hand Pie with Maple Glaze which was delicious! So many guest beers to choose from! 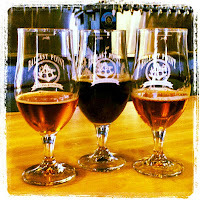 While they had several guest beers on tap, from Ballast Point, Green Flash, and Stone, just to name a few, I decided to sample the house beers instead. I started off the day with the Hop Vader, a Black IPA with an ABV of 7.1%. Since I'm a huge IPA fan, this beer was definitely a favorite of the day! 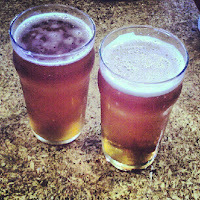 Cheers to Beachwood BBQ & Brewing! Next up, I sampled the Dank Epoch, a 10.7 % Triple IPA. Even though the ABV was nearly 11%, this beer was surprisingly easy to drink. My third beer of the day was the Knucklehead Red a 5.7% ABV American Red Ale. This is my second favorite style of beer and I really liked it! The fourth beer I tried was the Mandarin Dream, a 6.7% ABV Belgian Style Saison. This beer was light and refreshing, a great beer to enjoy all summer long. My final beer of the afternoon was also the one beer I was most looking forward to trying, the System of a Stout an 11.3 % Imperial Armenian Coffee Stout. This beer has been on tap a few times, but this was the first time I'd been able to finally sample it. Although I do not like coffee, I loved this beer. While I wouldn't be able to drink it on a daily basis, such as the Mandarin Dream, it is one I would love to try again. As always, I thoroughly enjoyed all of the beers made by Beachwood Brewing and I cannot wait until their second anniversary next year! Last week I was able to spend time in my hometown, San Diego. While I grew up in one of the craft beer meccas, I never have spent much time drinking or trying beer in the area. We decided to visit four breweries, all within a short drive of each other. Our first stop was El Cajon Brewing Company. 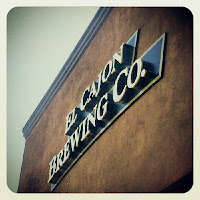 Although the list of guest breweries on tap was substantial, I was disappointed there were only two beers brewed by El Cajon on tap. 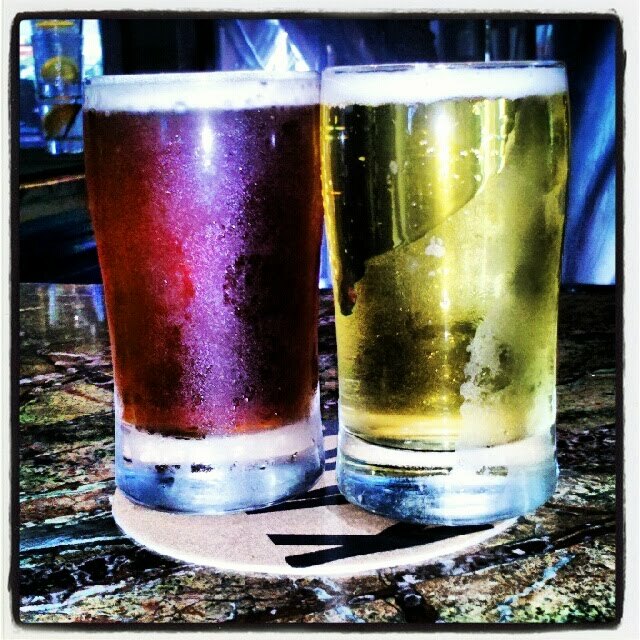 I tried both the Cauldron Crest Pils and Amaziah Red Ale which were both easy to drink and perfect for a hot afternoon, which are common in East County! 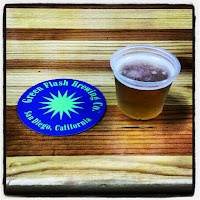 Next up was my favorite brewery of the day, Green Flash Brewing Company. All I could say as we entered the facility was, "Wow, this place is AMAZING!!!" It is a huge area which has all the elements of their brewery from brewing to bottling along with an area to taste some of their freshly made beer. 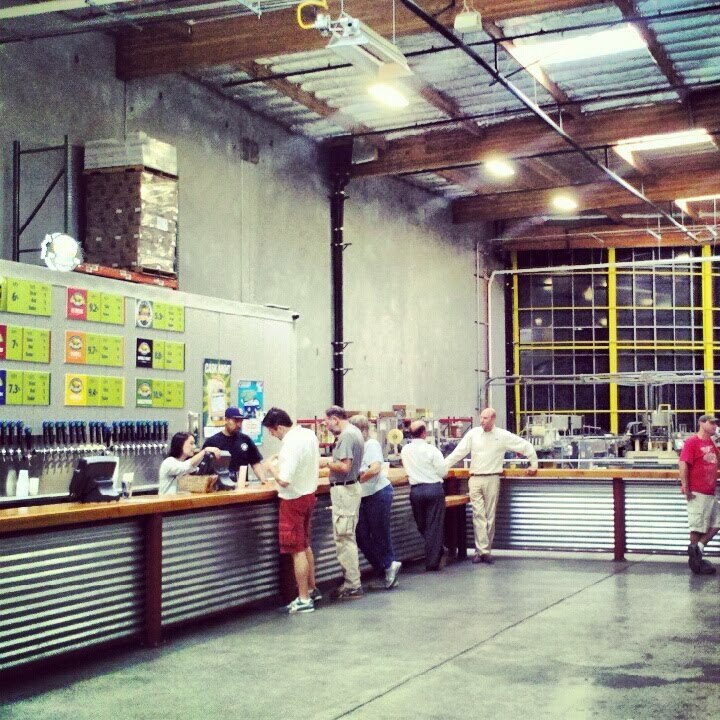 I loved the openness of the building as well as the separate area for merchandise and growler fills. I can see how this space, although larger than average can quickly fill up with eager beer drinkers! There were tours available, but we decided just to have some smaller sized samples. I really liked that they had petite tasters, as we had previously tried many of their beers on other occasions. I decided to try the Green Flash Retro XPA which was outstanding. 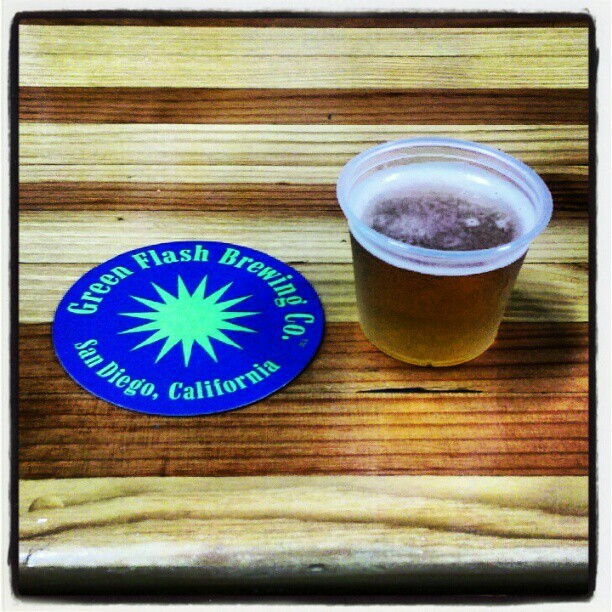 I love how Green Flash consistently creates great beer. 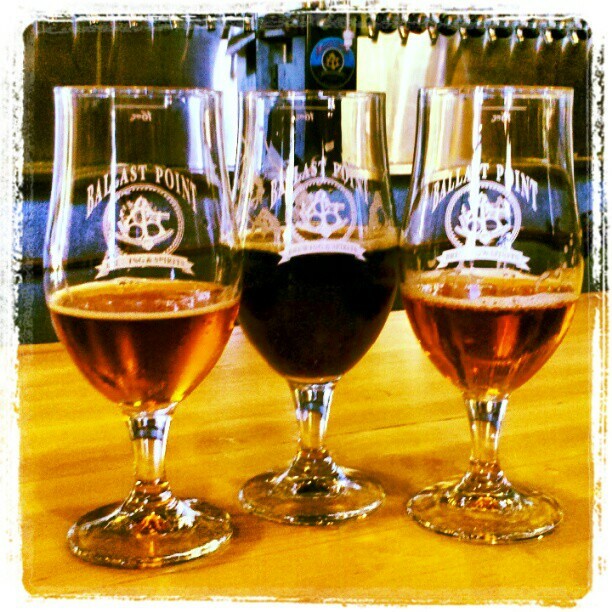 After our small samples of beers, we headed to stop number three, Ballast Point Brewing Company. Although there was a good sized crowd when we arrived, we were served quickly after our arrival. As with Green Flash, I'd had many of the beers that were on tap and was wanting to try something new. After looking over the tap list carefully, I decided to do a side by side comparison of the two versions of the Big Eye IPA one with and one without ginger. While both beers are very tasty, I preferred the non-ginger version. After a short time, we decided to continue on to our fourth and final stop of the day, Manzanita Brewing Company. Ever since I first learned there is a brewery located near where I grew up, I've been eager to try their beer. 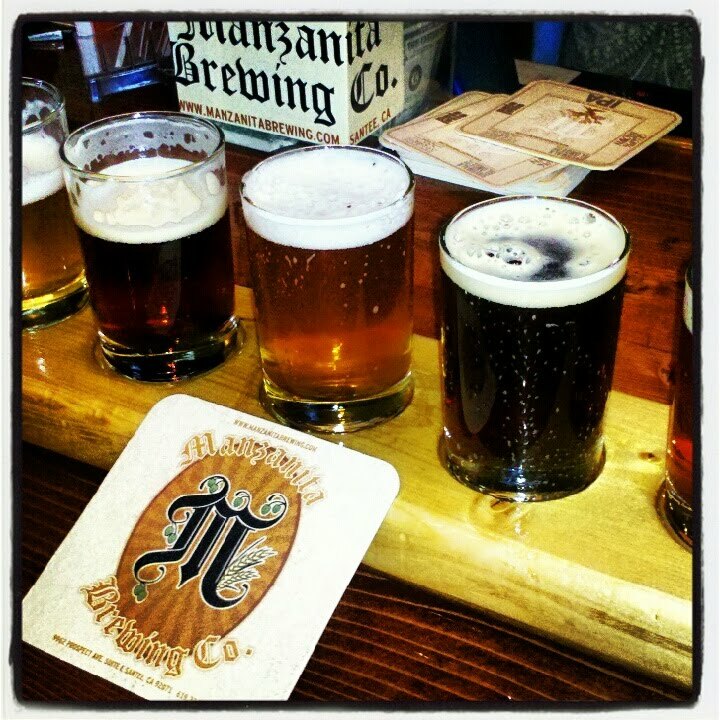 Manzanita Brewing Company, located in Santee, is near the 52 freeway in East County. Their small tasting room was filled with regulars who were both helpful and eager to talk about their local brewery. 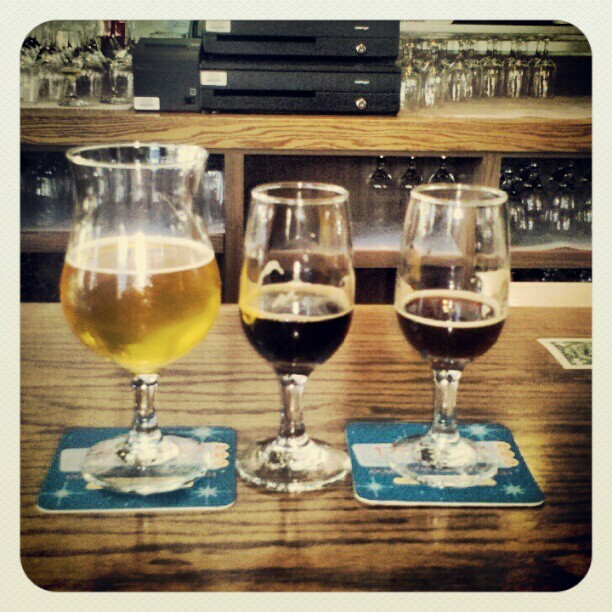 We decided to get a tasting flight of all of the beers. My two favorites were the IPA and Pale Ale. While we were visiting the tasting room, we found out that the brewery is moving just down the street. It is always exciting to hear about breweries who are expanding. I can't wait to visit more breweries in San Diego! One of my favorite local places to have great craft beer is at Killarney's Restaurant and Irish Pub in Riverside, CA. They recently celebrated their fifth anniversary, on Saturday June 16th. 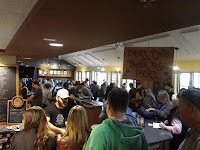 They had a fantastic selection of beers on tap from several local breweries such as; Ballast Point, Black Market Brewing Company, Bootlegger's Brewery, The Bruery, Hangar 24 Craft Brewery, Inland Empire Brewing Company, Packinghouse Brewing Company, Stone Brewing Co., and TAPS. The afternoon was a great time to sample new beers as well as visit with both new and old friends. For $30 you received a commemorative tasting glass to hold unlimited tastings of beer and a ticket for a choice of three food options. The food choices included pub tacos, three types of mac and cheese, and sliders. This was an awesome deal as the beer selection was outstanding and the food was delicious! Black Market Brewing Company, Hangar 24 Craft Brewery, and Packinghouse all sent representatives from their breweries to pour their beer. It is always nice to have a chat with those who make and promote a specific brewery! Packinghouse and Killarney's teamed up to create a collaboration beer for the event, BEL-Rynger, a Belgian IPA, which was one of my favorite beers of the day. I love when breweries come together to create a beer, especially when it is for a specific event. Having another opportunity to sample Stone's 10th Anniversary Ruination was a nice surprise. 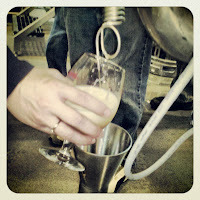 Another highlight of the day was trying Packinghouse's new beer Tipsy Tibbets which is a tasty Saison/Farmhouse Ale. I can definitely see myself drinking Tipsy Tibbets over the summer since it is both light and refreshing. Hangar 24's Imperial IPA, Essence is an outstanding beer, I liked it so much I had more than one sample of it. Having local breweries pouring beer at an event is always a bonus, having ones that also make great beer is a double bonus! Live acoustic music by the duo, Coleslaw was a great addition to this fun-filled afternoon. Gorgeous summer day for beer! Arriving in Paso Robles Friday afternoon, we were looking forward to partaking in some bottle shares with friends, but the super comfy bed at the Adelaide Inn was far too welcoming. 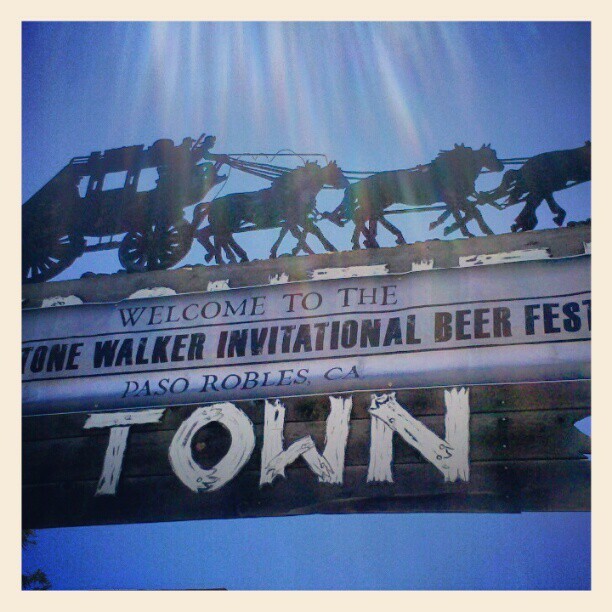 This made getting up bright and early on Saturday for the Firestone Walker Invitational Beer Fest that much easier. Waking up early without a hangover on the day of a beer event is always a bonus! After a quick carb-filled breakfast, we headed over to the Paso Robles Fair Grounds which were a short walk from our hotel. A nice crowd had already started to line up just outside the gates before noon, with the even set to begin at 1 p.m.. We were rewarded by standing next to a bbq smoker which smelled amazing. About thirty minutes prior to the even start time, we were ushered inside to get wrist bands and pick up our tasting glasses. We were surprised to also receive a plate, which had a cut-out for our tasting glasses, a small booklet with information about all of the breweries and beer that was scheduled to be poured at the event along with a handy dandy small golf pencil. The sun was bright and making it's presence known as we eagerly awaited our time to enter the fest. The Paso Robles Fair Grounds are not your run of the mill fair grounds. They reminded me of both Knott's Berry Farm and Disneyland with quaint old-fashioned buildings. 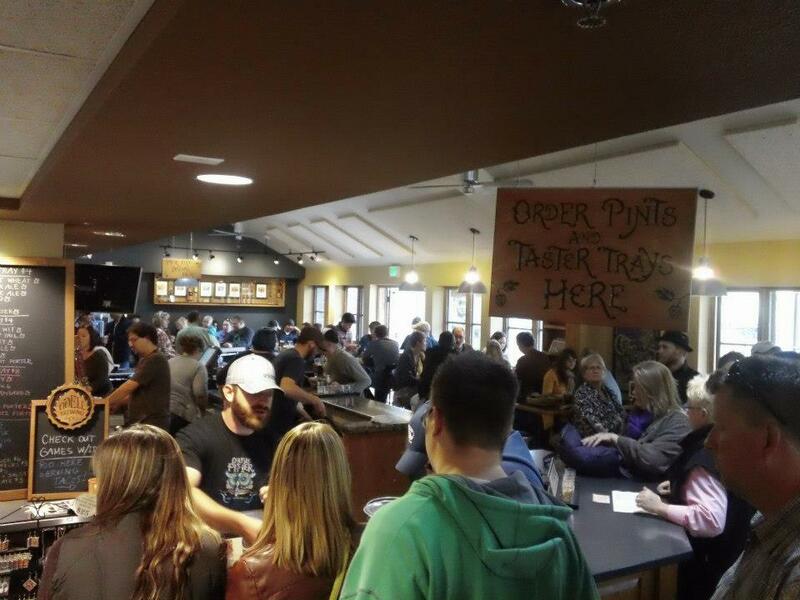 When the clock struck one, a majority of the people lined up hustled over to the 3 Floyds to have a chance to taste Dark Lord. Instead of following the crowd, we chose to visit Sun King Brewing first which had no line. While they had two beers on tap, they also had brought some of their cans of beer so they had a nice variety to choose from. I started my day out with their Osiris Pale Ale which was both tasty and refreshing. We ran into some friends who luckily are smart and had already grabbed a barrel to claim as our home base for the day. This was an excellent system as one of us (actually, one for most of the day, she deserves a medal) would stay behind while the others ventured out to get samples of all of the glorious beer. 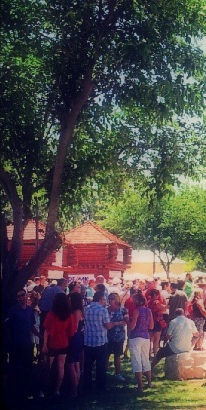 Walking throughout the different tents and tables was relaxing as most of the lines moved quickly. Quick moving lines at beer events always makes for happy beer drinkers! 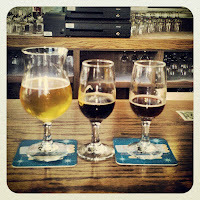 While I sampled many delightful beers throughout the day, I definitely had some favorites. Gatlin Damnosous by Anderson Valley Brewing Company was the first beer of the day that made my heart happy. A Sour Ale at 8.8% it was not only unique but had a fantastic taste. The longest line I waited in all day was for my second favorite beer of the day, Stone Brewing Company's Ruination Tenth Anniversary IPA. The wait to try their hoppy 10.8 % Imperial/Double IPA was definitely worth it, even though it is a beer I can easily find here in Southern California. Altered Beast by Bear Republic Brewing Company not only has a name that makes you want to try the beer but also has an outstanding taste. At 9.2%, this Imperial/Double IPA was another one that I would definitely like to try again. My final favorite beer of the day, was Nebraska Brewing Company's Melange A Trois (Reserve Series, Chardonnay Barrel Aged) Belgain Strong Pale Ale. This 10% beer was a nice surprise and makes me want to drive out to Nebraska for a visit to their brewery. Not only were all of the beer selections at the Firestone Walker Invitational Beer Fest top notch, the food we all had to choose from was also amazingly delicious. From wood-fired pizza, pulled pork bbq sliders, to bratwurst sausage sandwiches, there was something for everyone to enjoy. I was surprised to see some of the food booths were still serving food up until the end! 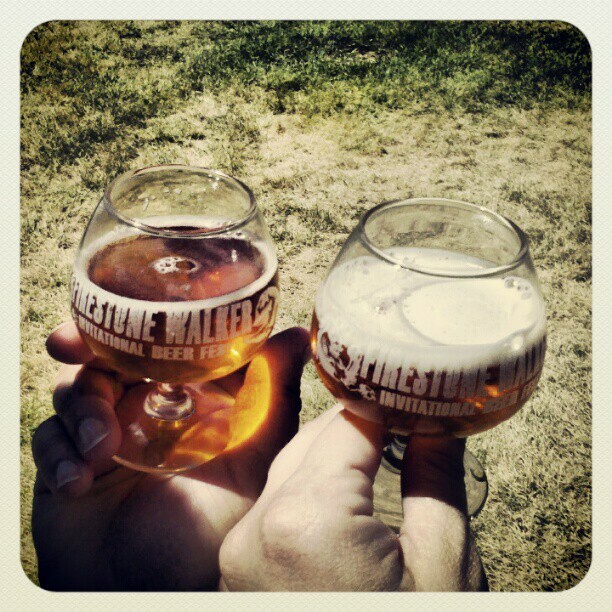 The Firestone Walker Invitational Beer Fest was a wonderfully well-organized event. I know I am already counting down the days until next years event! Epic Beer Weekend...the journey begins! 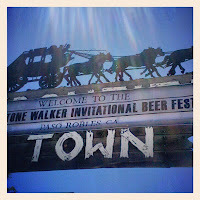 Last weekend was the informal kick-off of #summerfun, my most favorite time of year, with my journey to the Firestone Walker Invitational Beer Fest in Paso Robles, CA. This is an event that I have eagerly been awaiting since the tickets arrived in the mail back in February! On Friday, the journey from Orange County to Paso Robles was made much more delightful by stopping at two breweries for the first time along the way. Hollister Brewing Company , located in Goleta, CA is adjacent to the 101, which makes it an easy stop on the scenic trip up the coast of California. Located in an unassuming strip mall, the restaurant and brewery is a bright and open venue. Starting off with a full pint of their Hip Hop Double I.P.A., which won medals at both the 2008 and 2009 GABF (Great American Beer Festival) was a perfect way to start my beer journey of the day. At 9.5 % A.B.V., the beer was surprisingly easy to drink! I'd have to say, the Hip Hop Double I.P.A. was definitely my favorite beer I had while visiting Hollister Brewing Co..
With so many other beers that I wanted to sample on their menu board, a tasting flight seemed like the best way to proceed and I wasn't disappointed with any of the other beers that I tried including; 5th Anniversary Ale, Hollister Hefeweizen, Lucky Man Red, Tiny Bubbles, Table 42 Red, Patterson Porter, and The Pope IPA. Hollister Brewing Company, we had to continue our journey. 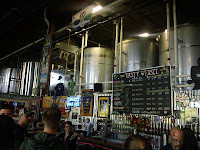 Upon the recommendation of some friends, we decided to visit Figueroa Mountain Brewing Company, located in Buellton, CA. When we first drove up to the industrial complex facility, we thought that their tasting room was just a standard small brewery facility. When we opened the doors to the brewery's tasting room, though, we felt as if we had walked into somebody's swanky living room. With tables and flat screen t.v.s in the outer lobby area to greet you, this was definitely someplace we wanted to spend some time in. The actual tap area also includes more seating with a view of the brewery production area which is simply gorgeous. You really feel as if you are hanging out at a (wealthy) friend's house. 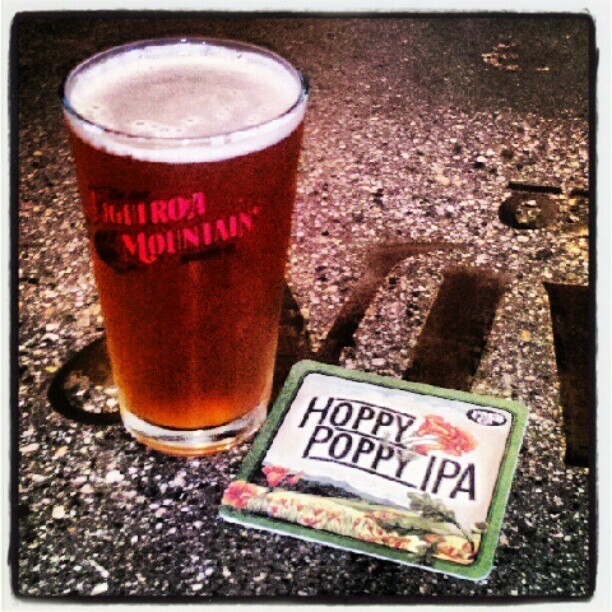 My first choice at Figueroa Mountain Brewing Co was their Hoppy Poppy IPA. I'll admit, I love IPAs, but the name is what really got me to choose this beer. I also had the Danish Red Lager and had a hard time deciding which one I preferred. 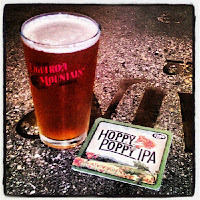 I really wish we had had more time to sample more of the beers at Figueroa Mountain Brewing Company. I know I will definitely be visiting again, though!